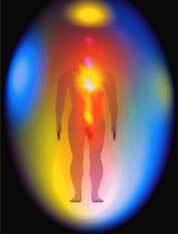 An aura is an energy field that emanates from a person or object. New Age Metaphysics refer to it as an electromagnetic field. It has been scientifically proven that all objects and humans have an electromagnetic energy field. The aura around a person or object can consist of more than one color; it can expand out far from the body or be close to the body. The color of the aura changes according to the mood for the individual. They can also be affected by the person’s physical surroundings, spiritual work, items in the room, crystals, gemstones, and health status. Aura energies are linked to colors much like colors are linked to the chakra centers. We are drawn to colors that we need to create balance in our lives. For instance, if you are drawn to the color red, you may be lacking in energy and vitality. The color red is also used to burn out cancer; it will warm cold areas and reduce pain. In learning about your aura or the aura of others you can work with your electromagnetic field to bring balance and healing to the needed areas.